First, I have to mention, I learned about the Keto Diet from Keto Bootstrap. You should, too! Check them out. The idea of this post came about when I was chatting with a fellow Keto diet groupie. This is a person that I talk to daily. We had both had a couple of down days. I knew I had been cheating a little too much on Keto. She had just gotten back on the Keto train. So we were both in the “I’ve gotta get back in ketosis” phase of the Keto diet. Two days after having our “down days” we were chatting again and since I live in the US and she is in Canada, we were chatting via text. I noticed something while we were chatting. I was talking over her, she was talking over me, we had ideas that were just spilling out of our heads, through our fingers and onto the screen… It was a cheerful, frenetic. borderline mad, conversation. At one point, we both realized, wow, we’re back in ketosis. About two months after I started Keto, my husband turned to me and said, “You laugh more now”. I don’t know what we were talking about or why I was laughing, but he was right. Which is a gift. I don’t know why I laughed less before or what changed after starting this diet that I now laugh more, but how joyful is that? I’ve always been a person whose emotions are right at the edge. I’m quick to cry, quick to smile. But now, there’s a joyfulnesss, a light heartedness, a mad happiness that I can’t explain. I have no idea what actually has caused it, but there are lots of articles about Keto and mood that support the idea. But shiny, happy me isn’t the only side effect. I’m also more focused. My memory seems to be better. My hair has grown like a weed. My hair has never grown past my shoulders and it’s on it’s way to mid-back if I let it go. I’m not tired like I used to be. I have energy to do stuff. This could very well be simply because I’m not carrying around an extra 25 lbs every day, every where I go. One of the very best side effects of Keto has been that I rarely get aches and pains anymore. Before Keto, I had pain in my ankles, knees and feet that prevented me from walking down the stairs well in the morning. I used to actually worry about if something happened and I had to quickly get out of bed and out of the house with the kids that I wouldn’t be able to move fast enough to get to them. I have none of that pain anymore, whatsoever. I have one nagging old gymnastics injury that will not go entirely away, but it definitely comes around less often. So as I started to think about all these sort of weird side effects I was getting, I decided to poll some of my online friends to see if there was any type of pattern. Turns out a lot of people had sort of weird positive side effects! And a few negative ones, too. 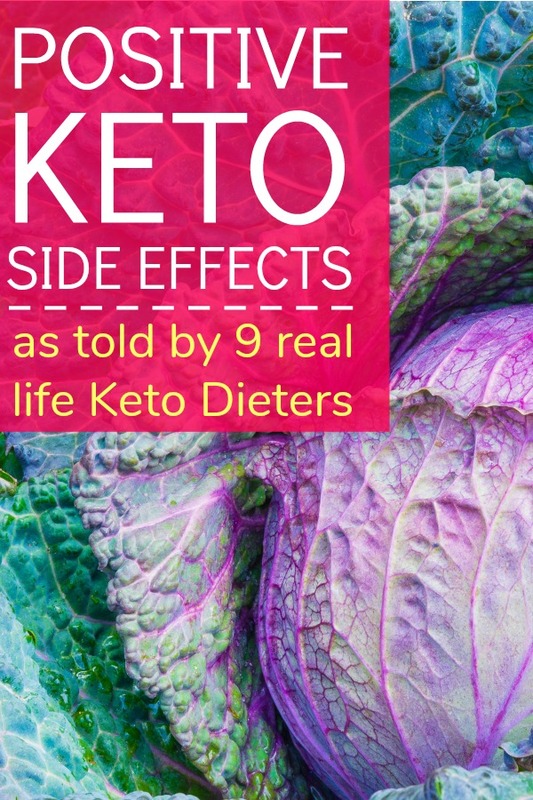 Here are, in their own words, the positive Keto side effects from my best internet friends. “When I get into ketosis my mood drastically improves. So much so that my anxiety, which can sometimes keep me housebound, just disappears. I mentally feel like a completely different person. I am eating keto, not for the weight loss this time, but for the mental clarity I get from being in ketosis. When a diet can change my energy, focus, and happiness in a few short days why would I eat any other way. Keto Benefits = less inflammation, less brain fog, more energy (weight loss stalled for me over 3 months ago…and I still have at least 20 to lose). I keep going because my fingers don’t swell and I hardly ever get a headache anymore (they were once a day with migraines thrown in before). Psoriasis on my hands disappeared. Warning: this post is TMI *** I’ve been eating Paleo for 8+ years, so transitioning to Keto was pretty easy for me (I had been slipping in and out of ketosis during times of extreme carb restriction, but just didn’t know that’s what it was called LOL AND I thought I was doing something ‘bad’ once I realized I was doing it. I had a urine test at the doctor’s office and the nurse was like, why do you have ketones in your urine? I thought I was hurting myself because they were so weirded out—AND because my urine smelled….a tell-tale sign for me that I have ketones in my urine). What I love about it is going even longer stretches without getting hungry….I hate cooking and making food, so I keep things very simple and this way of eating helps with that LOL. The other biggies are more even moods, more energy, and it definitely helps with hormones—let’s just say I’ve been out of ketosis for about a month and holy hell I’ve been the CRAZYPMSMOMMY this week and all I can think of is I HAVE to get back into ketosis so that I can just feel like a normal human (for the most part) without any mood swings LOL. My family will thank me, I’m sure. “I got into Keto to increase my energy. I was eating a lot of sugar and having horrible hypoglycemic episodes. No more hypoglycemic episodes, the bloating is gone, I have more mental clarity, no more dizziness, more energy and lower blood pressure. I have lost 27 pounds. I did have a bout with low potassium which was pretty scary. I think that was brought on by a combination of Keto and BP meds (I don’t take the meds anymore). I am not as strict as I used to be with Keto, but I still limit bread, rice and pasta. I do enjoy an occasional dessert. Neither my husband or I enjoy cooking. Even eating is sometimes a bit of a chore – which led to us eating the wrong things. Keto meals tend to be so simple and can be thrown together quickly and easily without too much thought. It has taken so much stress out of our lives. Oh yes – I forgot a big one. But for my husband, not me. He suffers from ibs- we had years of doctor and specialist visits, trying all sorts of medication and diet changes. Nothing helped much and he was just getting worse. Keto (with intermittent fasting) has had the biggest impact so far in improving the symptoms. “I have only been doing it for about 12 weeks. I have no idea how much weight I have lost because I don’t own scales, but I am down a dress size, so that is nice. Keto, for the 9 people above, is clearly about a LOT more than weight loss. If you’re interested in learning more about the Keto Diet, Elisa at Keto Bootstrap has you covered. Keto Bootstrap has meal plans, exercise plans (which I’m totally going to do someday, I SWEAR! ), grocery lists and a community where you can get all your Keto questions answered! Wow, that’s amazing! I’m glad to hear he’s doing well :-). Was the diet prescribed to him by a doctor? My 8 year old nephew was diagnosed with asthma and Crohn’s disease over a year ago. He had flareups at least 4 times a year, and his meds made him feel almost as bad as the flareups. He also couldn’t move without hacking up a lung. He has been keto for 4 months now and his bloodwork and lung function is better than it has been in years. He rarely coughs and has not had a flareup. Hey there! Congrats to you for making it a month! I still have an occasional french fry, too. But I find the less I do that, the less I have cravings for things like that. The one thing I try really hard not to cheat with is sugar. Sugar is my worst enemy and I know now to avoid it like the plague! Keep at it! I’m glad it’s working well for you! I’ve been in Keto for around a month by now and i ate like trash for 2 days (today is one of those days) and i’m not really sure if im in ketosis anymore. The reason im allowing myself badly to eat whenever im havng major cravings is because i want this to be my lifestyle, i dont want to forbid myself from foods i enjoy such as bread and fries. I’ve been struggling the past while to stay on track. In this month, i noticed drastic changes in my weight and skin. I feel healthier and so much lighter too! I will remain eating keto foods and will satisfy my cravings every now and then.